High in Omega-3 fatty acids, fish's heath benefits are well known. We carry a great selection of the best freshwater and saltwater fish available, so there's never been a more delicious way to eat your way to good health. 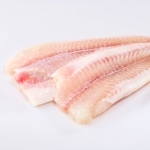 Tender and flaky and full of flavor, pollock is a long time favorite with a mild, clean taste. Sold by the 10 lb package.